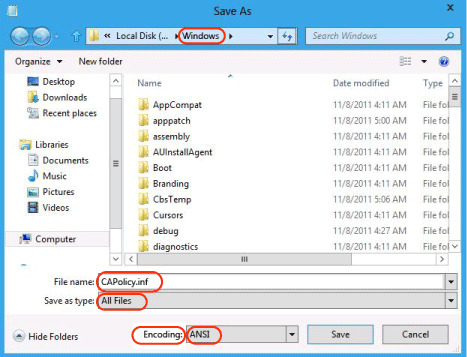 On CA1, you must prepare the CAPolicy.inf file before installing Active Directory Certificate Services. To perform this procedure, you must be a member of the Administrators group. Open Windows PowerShell, type notepad c:\Windows\CAPolicy.inf and press ENTER. When prompted to create a new file, click Yes. When you are prompted to overwrite the file, click Yes. Be sure to save the CAPolicy.inf with the inf extension. If you do not specifically type .inf at the end of the file name and select the options as described, the file will be saved as a text file and will not be used during CA installation. In the CAPolicy.inf, you can see there is a line specifying the URL http://pki.corp.contoso.com/pki/cps.txt. The Internal Policy section of the CAPolicy.inf is just shown as an example of how you would specify the location of a certificate practice statement (CPS). In this guide, you are not instructed to create the certificate practice statement (CPS). To learn more about policy statements including CPS, see Additional Resources1.